This recipe is a godsend when you don't have free hands to make polenta. It comes from Paula Wolfert's The Slow Mediterranean Kitchen and it's remarkably easy to do. Be forewarned that it does, however, take about an hour and a half to cook. 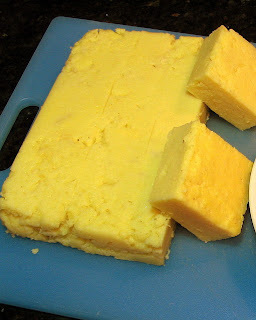 It can be used to make a soft or medium polenta. Soft polenta will require a ratio of 5 parts liquid to 1 part cornmeal. A medium polenta will require a ratio of 4 parts liquid to 1 part cornmeal. I prefer to use chicken or vegetable stock when making polenta and I also add herbs or cheese the last 10 minutes of cooking for added flavor. This is amazingly simple to do. 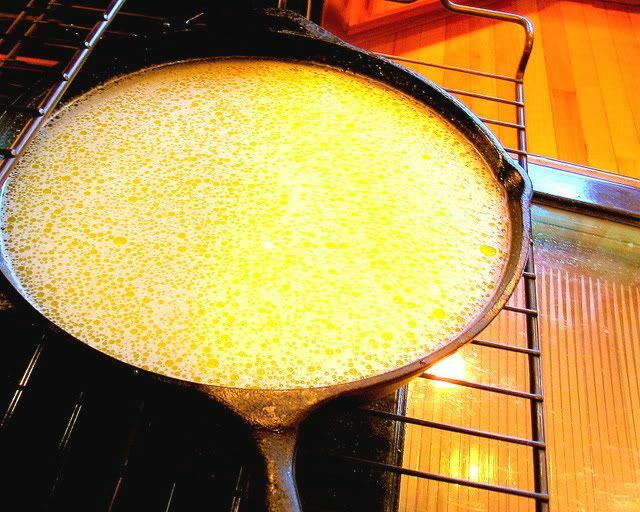 1) Preheat oven to 350 degrees F. Grease a 12-inch cazuela, skillet or ovenproof casserole. Add cornmeal, liquid, butter or oil and salt. Stir with a fork until blended - the mixture will separate but no need to worry. Bake uncovered for 1 hour and 20 minutes. 2) Stir polenta with a long-handled fork. Adjust seasoning to taste. If adding herbs or cheese this is the time to do it. Bake for 10 minutes longer. Remove from oven; let rest for 5 minutes. If serving soft polenta, pour into a serving bowl. If serving medium polenta, pack it into a rectangular or square pan to fasciltate cutting serving size portions. Yield: 6 servings. Oh that looks delicious. Thanks for sharing the recipe. I am so glad you posted this! I have been craving polenta lately! I want to make this version!! Looks lovely! That sounds wonderful! My sister made a polenta topped apple cobbler for Christmas and it was great! I agree about the stock...it makes it so much richer! And the best polenta is available from Carol and Anthony Boutard, who grow and grind their own heirloom organic corn, at the Hillsdale Farmers' Market every other Sunday through the winter. That is some fantastic click. Thanks for sharing the recipe too. Oven baked! Must remember this one. Hope you're having a grand time on your trip. This is my first time to make polenta and this recipe came out PERFECT. I was thinking this will splatter all over the oven during baking, but NO SPLATTERING at all. Came out creamy and delicious! I used 5 cups water/milk to 1 cup polenta. Added 1 cup grated gruyere cheese during last 10 minutes of baking. My search for perfect polenta is this recipe. Tasted just as good as served in a fine restaurant. Forgot to mention that I only baked the polenta for 40 mins. (not 1 hr., 20 mins. as specified), then additional 10 mins.